Marvel.com: Venom has fought bad guys all across the galaxy—what about Kraven might make him uneasy? Mike Costa: I think Kraven also has an utterly fearless approach. I think that’s one of the things that makes him scary—Kraven has always been supremely confident in what he can do. He is sort of the ultimate predator and you kind of can’t sneak up on him and you can’t get the advantage on him. So, as you’ll see later in the story, Kraven comes prepared for his second encounter with Venom; the first was just sort of luck and it kind of ended in a draw, but the second time, Kraven will be much more prepared. Kraven understands his prey and he knows how to find their weak points and I think that makes him a very legitimate threat to Venom. Marvel.com: What made you choose Kraven to be in this series? 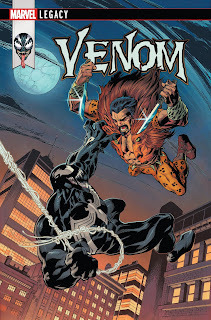 Mike Costa: I’d also thought, if we’re going to include Kraven, it felt like a sort of a confluence of events, because editors Devin Lewis, Nick Lowe, and I wanted to do essentially a spiritual sequel to David Michelinie and Mark Bagley’s VENOM: LETHAL PROTECTOR. Obviously not a direct sequel, but an homage to it—a pastiche—because of Marvel Legacy and that’s one of the major stories that defines Venom. That served as the character’s first solo book and now we’re on the VENOM solo book and we felt like it would be nice to give a nod to that. Marvel.com: Between Venom and Kraven, who would you say is more of a raging psychopath? Mike Costa: [Laughs] Venom has this instability to his character on multiple levels. It’s a man who already has sort of a broken moral compass, hosting an alien from outer space that does not have the human conception of morals and ethics, also slowly being compromised by poison. So Venom seems like the wild card, but if you’re going on pure psychopath, probably Kraven. He’s in total control of his actions and makes a conscious decision. He’s very deliberate and he’s very implacable in that way; he knows exactly what he’s doing, he likes hunting things, he likes killing things, he likes bathing in blood and skinning things. He likes death and he creates it. That’s not true of Venom. For all of Venom’s faults, Venom does not celebrate death, but Kraven absolutely does. Marvel.com: Can you discuss the process of getting inside the head of an antihero like Venom? Mike Costa: It’s honestly a big challenge because Venom has always been a complex character that the editorial team and I had a lot of conversations about. He’s become even more complex because he’s really two people in one—two people meaning the suit and Eddie Brock. Then the person that they create—the character they create—becomes Venom, a combination of the two. In any given scene, I might have Eddie’s internal monologue or the internal monologue of the symbiote or we might be reading the dialogue of Venom himself, who acts as a combination of the two. It’s an ambiguous idea—who’s truly speaking in those moments. Is it Eddie? The symbiote? Some combo of the two of them? He’s not a pure villain, he’s not a pure hero. I think that Eddie, in his own way, can be more amoral than the symbiote. Eddie made the decision long ago that he would do whatever necessary to get what he wanted. At the time, it was to kill Spider-Man, but he also has a very strict moral compass in that he does distinguish between innocent people and guilty people. But his definition of who’s innocent and who isn’t, can be a very particular thing and there end up being a lot of thorny questions surrounding that. I feel like the symbiote, for a long time, got played as this sort of mindless creature motivated by anger and base emotions of hate and desire. 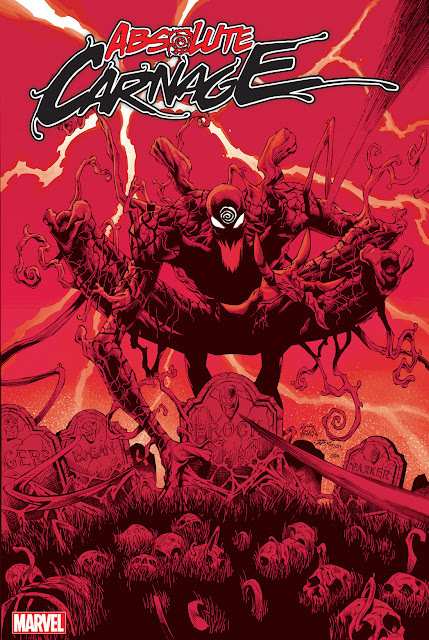 I really tried to examine that in issue #154 because the symbiote, over the past 10 years in particular, has been through a tremendous amount of changes. It’s been bonded with Flash Thompson—an unambiguously good man and hero—and then it bonded to Lee Price—an incredibly evil man. I kind of view the symbiote as almost like a naive child that tries to understand the world and wants to do the right thing, but doesn’t know the right thing and sometimes takes the wrong lesson. So, “Who is Venom?” We’ll address that questions even more specifically and fundamentally in the next year or so of VENOM comics. We’ll directly deal with the relationship between Eddie and the symbiote and nail down some of those answers in a much more concrete way going forward. Marvel.com: Considering Marvel Legacy, how do you think each of these characters would like to be remembered in terms of their respective legacies? Mike Costa: I think that Venom really would like to be remembered as a hero. I think that’s less important to Eddie to be a hero, but the symbiote ultimately wants to do good and the symbiote would love to be remembered as a force for good in the world. Eddie, I think, feels more ambivalent about that. He won’t refuse to do good, but the symbiote has become a part of him that he needs and that he missed tremendously when it left. He tried out several other symbiotes in the time between losing the Venom symbiote and gaining it back; there’s some part of him that yearns for it. He feels incomplete without that. VENOM #158, by Mike Costa and artist Mark Bagley, drops on November 29!